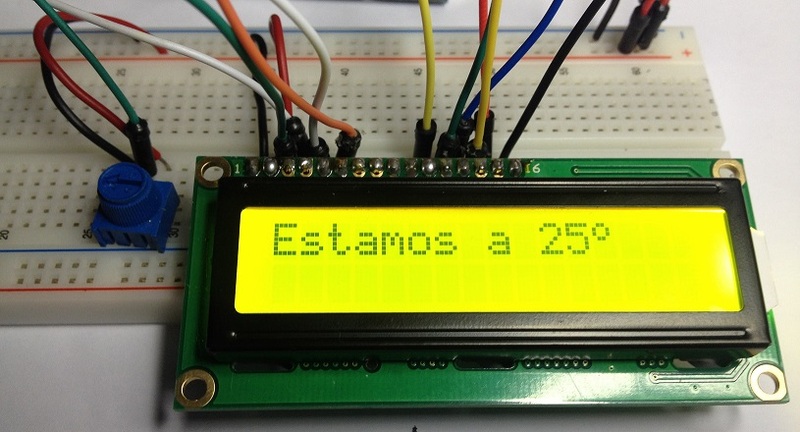 We are going to connect a 16×2 LCD display to our Arduino. We will see how to define some special characters. Arduino Uno or equivalent. This chapter accepts any other Arduino board. A 16×2 or 16×4 LCD display. The 7-segment LED displays, we saw in the previous chapter, are fine, they are cheap and practical, but have the disadvantage that they can not display text messages, only numbers. But we can miss some system to display simple text messages, and so the LCD displays were built. They are easy to find in different formats: 16 × 2 (16 columns x 2 rows) or 16 × 4 (16 columns x4 rows). LCD stands for Liquid Crystal Display. They are a very simple option and also give a very pro touch to your projects, so, in recent years, the LCD displays have gained wide acceptance in commercial products of all kind. They are available in several sizes and configurations. They are low consumption devices. They are very practical, if you only have to show alphanumeric characters (and perhaps some special characters). In this chapter we will see how to connect them to your Duinos and how to use them to send messages to the outside world. Although, lately, these displays are usually sold with the pin strip welded, there are still many places that sell them as a kit, with the pin strip unwelded. At some point we will have to talk about how to weld components, but that day has not yet arrived.. The first thing you have to know is that you do have to weld them, you can not just stick them together more or less wildly. You do have to weld them. Get used to it. Any other solution would end up malfunctioning or directly burning out the display. When you have it ready, stick the display on the breadboard, leaving room for other components and wires. Remember that there will be many of them, so be generous with the room you leave. The connection is not complicated, but you have to be careful. So let’s go step by step connecting the different cables. Start connecting Vcc and GND to the breadboard. If you connect now the USB cable to your Duino, the LCD should light, if not, check your wires before proceeding. Let’s connect now the adjustment potentiometer. Connect one end of the pot to GND, the other end to 5V and the center pin to the pin 3 of the LCD. If all went well, we can turn the display and test it. Connect the USB to your Arduino and let’s see. If you’re turning the potentiometer, at some point you have to see some squares on the screen, otherwise check the connections. Do not go ahead if you do not see it. If you see the arrays of dots on the screen, we can continue. We will now connect the data and control pins. Without going into many details, we will not use all available pins because we do not need them. We will only use two control pins, RS (Register Select) and EN (Enable), and the 4 data pins D7, D6, D5 and D4. We do not need more for now. And now the data wires. Be careful because the pins that have used do not correspond to the pins used in the examples of the LiquidCrystal library. You can change them, given the case, but ensure that you also change the pins in the definition, or the sketch will not run..
Watch out: as always the first line, the one on the top, is the line 0 and the second is the line 1. These display are hard to wire, but very simple to use. Let’s try to make a clock (very simple so far). If you remember the functions we have used in recent chapters, we can recover some of them to show the value of the millis() function as if it were a clock. That means that we will return a String type parameter. At some point the function will have to use a return (String) statement. In this line you should not confuse (though they are written exactly the same), the String type used to define the string variable S on the left, with the String(n) function, that converts a number n in a text string, so we can concatenate the number of minutes and seconds into a text string using a semicolon character. Remove the blank spaces and look what happens when minutes change. How would you solve it, without using the trick of putting those blank spaces at the end? Think about it. What it does is to position the cursor on the display, in the column 6 of the second line to write the time centered. Here you have a mini video with the result. The LCD library includes several interesting examples that you should try. Remember, you have simply to change the definitions of the pins in order to work properly..
A particularly interesting example is CustomCharacter, which defines a set of special characters and moves them around the screen, depending on the values read from a potentiometer. Without going into too much sophistication, it is very interesting to see how to define some special characters, because in the character’s table of the LCD are not included symbols as ñ, accents, degrees or even €. So, just in case, it could be interesting to know how to define your own symbols. Let’s define our own character, the degree symbol, for example. The first thing you have to know is that the characters are defined as an 8 × 8 array (yes, again), as if you draw it in a grid of that size, filling the full little square. And now it is already available. Please note that we can only define eight special characters in a given time (although we can define 30 arrays of characters, create them and destruct them on the fly). Finally, and to close the chapter (everything comes in life), I have to tell you again that we have assembled this display in the hard way, connecting a lot of wires. All this work can only be justified because one day I swallowed the bait and bought a one of these displays (actually two. I have also a 16 × 4 display), but if you are going to buy an LCD display, for God’s sake, buy one I2C display or something like that, your mental health will improve a lot and you will only have to use 4 wires. In the next chapter we will assemble one of them for you to see the difference. We have seen the 16×2 LCD displays. It has been hard enough to understand that, as an exercise, it is fine, but we’ll see other less laborious ways to use these kind of displays. There exist also 16×4 displays (16 columns and 4 lines), just in case you need more room in the display. They are very comfortable to use because we can print alphanumeric texts directly, like a serial port. We can (and we will have to do it, surely) also define characters and symbols not included in the display.